Sodium bromide is an inorganic compound with the formula NaBr. 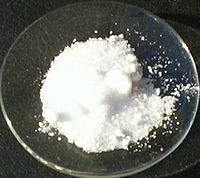 It is a high-melting white, crystalline solid that resembles sodium chloride. It is a widely used source of the bromide ion and has many applications. NaBr crystallizes in the same cubic motif as NaCl, NaF and NaI. The anhydrous salt crystallizes above 50.7 °C. Dihydrate salts (NaBr·2H2O) crystallize out of water solution below 50.7 °C. NaBr is produced by treating sodium hydroxide with hydrogen bromide. Sodium bromide is the most useful inorganic bromide in industry. It is also used as a catalyst in TEMPO-mediated oxidation reactions. Also known as Sedoneural, sodium bromide has been used as a hypnotic, anticonvulsant, and sedative in medicine, widely used as an anticonvulsant and a sedative in the late 19th and early 20th centuries. Its action is due to the bromide ion, and for this reason potassium bromide is equally effective. In 1975, bromides were removed from drugs in the U.S. such as Bromo-Seltzer due to toxicity. Once a large need in photography, but now shrinking, the photosensitive salt silver bromide is prepared using NaBr. Sodium bromide is used in conjunction with chlorine as a disinfectant for hot tubs and swimming pools. Sodium bromide is used to prepare dense fluids used in oil wells. NaBr has a very low toxicity with an oral LD50 estimated at 3.5 g/kg for rats. However, this is a single-dose value. 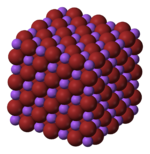 Bromide ion is a cumulative toxin with a relatively long half life (in excess of a week in humans): see potassium bromide. ^ a b c Pradyot, Patnaik (2003). Handbook of Inorganic Chemicals. The McGraw-Hill Companies, Inc. ISBN 978-0-07-049439-8. ^ a b c d e f g h i j k l "Sodium bromide". ^ Seidell, Atherton; Linke, William F. (1919). Solubilities of Inorganic and Organic Compounds (2nd ed.). D. Van Nostrand Company. ^ a b "Sodium Bromide (NaBr)". korth.de. Korth Kristalle GmbH. Retrieved 2014-06-11. ^ Polyanskiy, Mikhail. "Refractive index of NaBr (Sodium bromide) - Li". refractiveindex.info. Retrieved 2014-06-11. ^ a b "Sodium bromide MSDS" (PDF). sciencelab.com. Sciencelab.com, Inc. 2013-05-21. Retrieved 2014-06-11. ^ Eagleson, Mary (translated by) (1994). Concise Encyclopedia Chemistry (Illustrated, revised, English language ed.). Berlin [u.a. ]: Walter De Gruyter. p. 996. ISBN 9783110114515. ^ Hirota, Masayuki; Tamura, Naoyuki; Saito, Tsuguyuki; Isogai, Akira (2010). "Water dispersion of cellulose II nanocrystals prepared by TEMPO-mediated oxidation of mercerized cellulose at pH 4.8". Cellulose. 17 (2): 279–288. doi:10.1007/s10570-009-9381-2. ^ "Bromide: Potassium & Sodium". canine-epilepsy.com. Canine-Epilepsy Resources. 2011-05-31. Retrieved 2014-06-11. Wikimedia Commons has media related to Sodium bromide. This page was last edited on 1 February 2019, at 11:34 (UTC).